As usual, Hollywood Gothique began its annual Halloween Haunt Odyssey a little early this year. This ritual trek began back in 2005, when we tried to hit as many Los Angeles yard haunts as possible on Halloween Night. However, as more and more of these amateur extravaganzas have appeared on our radar, October 31 no longer affords even the illusion of enough time to reach them all; consequently, we have taken to venturing out on evenings preceding the big night, exploring those home haunts that open early. 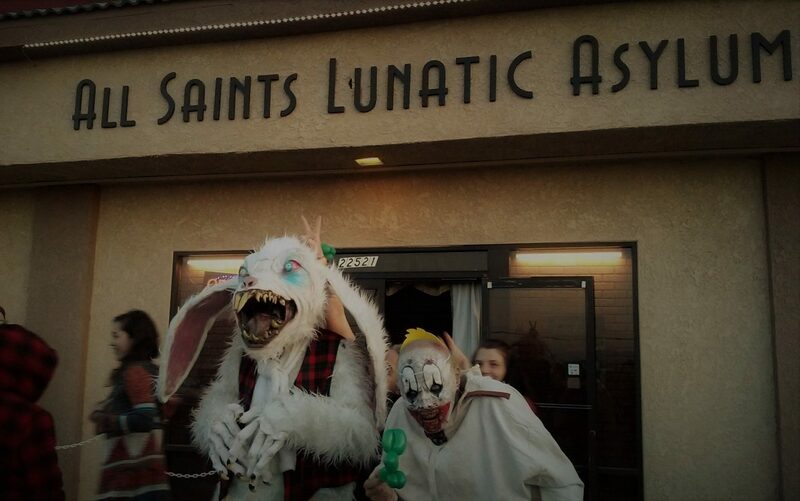 On Thursday, we stopped in for laughs and giggles at the Boney Island Yard Haunt in Sherman Oaks (you can read our mini-review here); last night, we braved the terrors of two amateur attractions in Burbank: The Backwoods Maze and Fear Family Hospital. 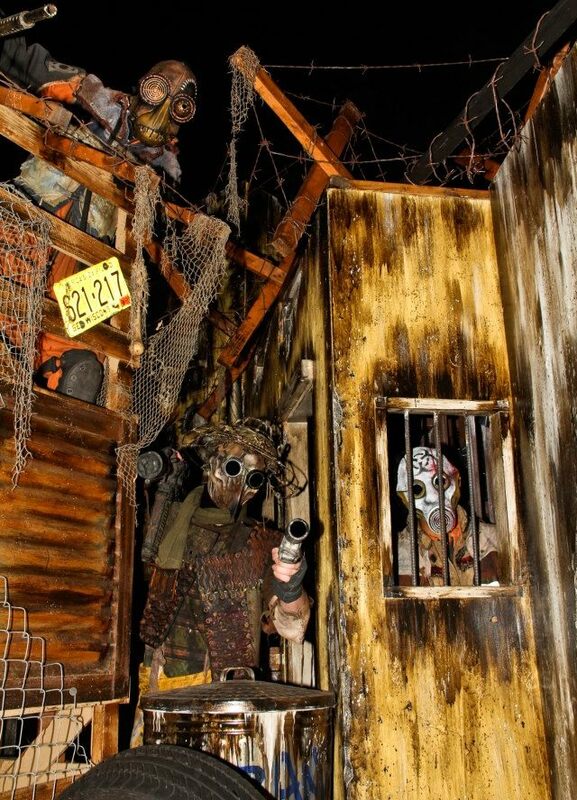 The Backwood Maze yard haunt is an old favorite: the walk through a neighborhood back yard is fraught with enough thrills to match most professional Halloween attractions. For Halloween 2012, the Backwoods Maze has revised its theme, abandoning backwoods cannibal crazies in favor or post-apocalyptic mutants. The change is not quite as radical as it sounds; the setting is still a series of wooden corridors, suggesting a habitat created with low-tech means from available materials - serving equally well as cabin full of cannibals or a barracks full of mutant soldiers. In the darkness and confusion of the twisting corridors, the monsters may not seem obviously different, but if you can steel your nerves long enough to take a good look, you will see that the cannibal crazies are gone, along with their slaughterhouse paraphernalia, replaced by militaristic props. The revised look puts a new layer of icing on the cake, but the underlying strategy remains the same - and as effective as ever: tight spaces, with little room to maneuver, force you into unpleasantly close confrontations with the denizens of the Test Zone (as the sign above the entrance identifies this year's maze). If you have yet to visit the Backwoods Maze this Halloween (or have never been), make the effort now. The attraction's remaining days are October 27, 28, and 31, from 7pm to 10pm each night. The address is 1912 North Pepper Street in Burbank. Not far away (although actually closer to the Spider-Lights yard haunt and Rotten Apple 907's Wilsley manor) is Fear Family Hospital. This one just blipped onto our radar thanks to a fan who alerted us to its existence; however, it has apparently been around for a decade and a half, although not at its current location. Fear Family Hospital consists of an outdoor walk-through maze set up in the yard of a corner lot, which affords lots of size. It features a different vibe from most yard haunts; as you approach, you are likely to hear live heavy metal music (sixteenth note bass drums and all) blaring forth. 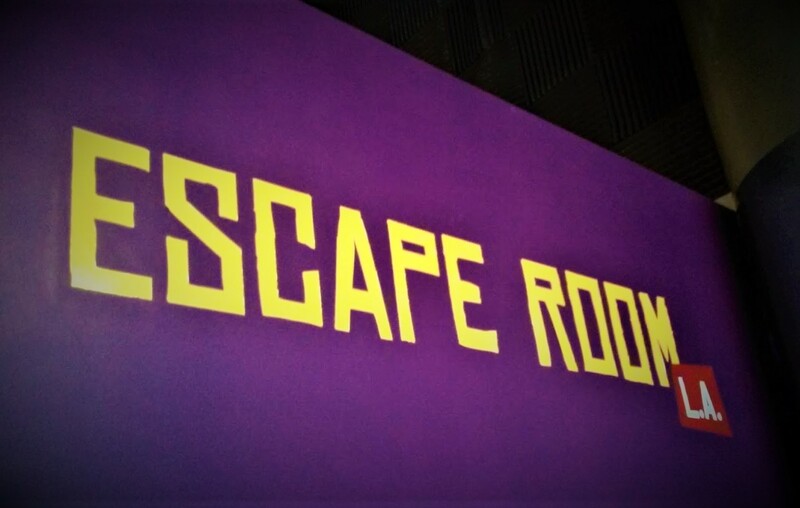 Once inside, you are taken on a guided tour by a crazed doctor, who shows off his various implements (guillotine, electric chair, embalming needle). Unfortunately, the tour has a bit of an improvised feel, with the actor stretching his moments a bit too long, sometimes without a punchline at the end (e.g., the guillotine is displayed, but it doesn't actually do anything). There are a few good scares with hands reaching out from beneath the black plastic "walls," and there are some nice decorations, but this is mostly a neighborhood-level event - worth checking out if you happen to be in the area to see Wilsley Manor or Backwoods Maze, but not worth a special trip all on its own. At least it saves the best for last: a ghoulish operation room scene with a victim on the table being disemboweled by a cannibalistic "executioner" while the heavy metal band blasts away in the background. It's a fairly original bit of business, with a home-made (rather than a store-bought feel) - an effective theatrical vignette that requires the audience to pause and see what's happening instead of just walking around while being goosed by ghouls in the dark. Fear Family Hospital is located at the corner of Ontario Street and Chandler Boulevard in Burbank (be careful: the haunt can be hard to spot when driving east on Chandler; the actual entrance is on Ontario). Remaining dates are October 27, 28 and 31. Tours start at 7:00pm (in theory at least; ours did not begin until 8:00pm on Friday, but that was opening night.). The show runs until the crowd is gone, probably around 10pm on Sunday, but later on Saturday and on Halloween Night.